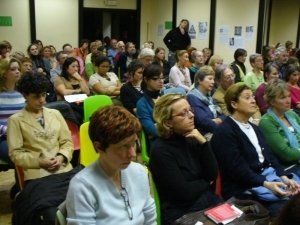 BRUSSELS, Belgium - Dozens of people in this Belgian capital participated in an evening devoted to Anna Politkovskaya on Saturday, during which book excerpts and articles by the slain Russian journalist were read. There were several Belgian celebrities among the nearly one hundred participants, including journalists Jean-Jacques Jespers and Yurek Kuczkiewicz, author Thomas Guntzig, the President of the Human Rights League Dan Van Raemdonck and the actor Ben Hamidou. Chechen activist Tina Ismailova read a letter she’d written to Politkovskaya. The event was organized by the local NGO "Groupe Tchétchénie" and supported by a number of foreign NGOs. Anna Politkovskaya was a Russian investigative journalist who specialized in writing about Chechnya and the Northern Caucasus. She was murdered in Moscow on October 7.